If you find yourself living alone either through choice or circumstance, going on holiday by yourself can be a daunting thing to overcome. However, taking small steps, enabled me to finally enjoy my first holiday alone – with complete strangers! My husband and I were seasoned travellers and enjoyed many holidays overseas. But sadly after some 56 years together, my husband passed away, and as a still ‘young at heart’ woman in my 70’s it took me some time to come to terms with the fact that life goes on, albeit a different kind of life. I decided to set myself goals to help me move on and to occupy my days. After successfully overcoming a few hurdles I began to think of holidays, and wondered if I could ever go away on my own. I discussed this with my family and fairly soon after, my son and his wife invited me to join them on a cruise, giving me something else to work towards. Whilst I obviously wasn’t completely on my own on the cruise as I had the ‘safety net’ of my son and his wife, unlike on previous holidays with my husband, I wasn’t one half of a couple anymore, but I really did enjoy it. Strangers who became friends on my first holiday alone! 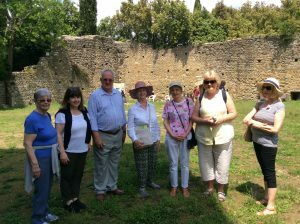 When we returned in August I thought about other holidays but decided I couldn’t expect to tag along with family all the time but in October I noticed a singles holiday leaving in May to Tuscany and I wondered if I was ready to take this big step. So once more I discussed it first with my family. Of course they were very encouraging and commented that if I didn’t try, then I’d never know! So I plucked up courage and booked my first holiday alone. As the holiday drew nearer, I must admit to feeling a bit anxious, asking myself all the usual questions; what if I don’t make friends, what if I’m lonely? So just in case, I went ahead and booked some additional trips to fill any spare time! On departure day I worried (unnecessarily) about checking in at the airport, and if I’d find the right group of people for my trip. However it was all so easy and straightforward and even as I was trundling along with my suitcase a young woman spotted my luggage label for the tour operator and said ‘ ME TOO’! I’d made my first friend and others quickly followed. In the departure lounge I met three other ladies on the same tour so the ice was broken, they all seemed very friendly Once boarded on our flight I was seated next to two more ladies on the tour and it was all looking a lot more positive, my worries began to fade away. At our destination airport we were met by our Tour Manager who led us all to the coach for the transfer to the Hotel, and after settling in, we all met for a welcome drink. There were about 30 people, mainly females, but there were 4 (brave!) gentlemen there as well. It was an interesting mix of widows, widowers, divorced singles and even some who just preferred to holiday with friends rather than their spouses. We all go on very well and there was ample opportunity to mingle with different people all the time. 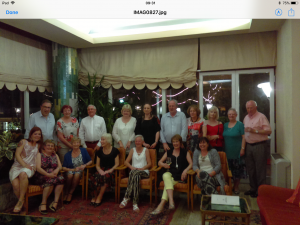 We all had a great holiday and on our return we decided to keep in touch and so created an online group which has also made such a difference to my daily life with the odd message coming through which really brightens my day. Doing anything for the first time on your own is always a little bit stressful, and it’s perfectly natural to be anxious about taking that big step of taking your first holiday alone. But for me, it was well worth it and I will definitely be booking more ‘singles’ holidays with this group.